These earrings use one of the new shapes I cut, a simple circle with an arc removed at the bottom. I added glass flower beads, black with a blue iridescent flash on one side. 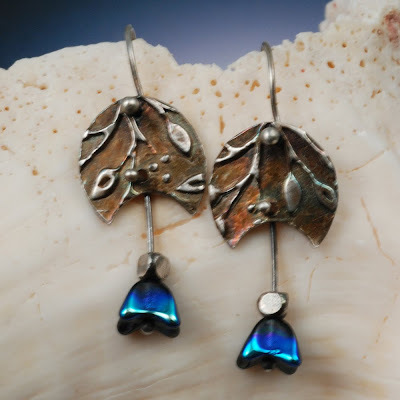 Technically, although the metal clay part of these earrings is almost trivial, the earrings take some work to assemble since I'm using beaded wires for earwires and connections. No commercial findings or lazy wire-wrapping for me, no! I do like the finish of those tiny silver balls and knowing that all connections are secure and just so. As to an Earring-A-Day challenge, I think it's a great idea, but one that I can't truly commit to, knowing what's going on in my life right now. I can give it a half-hearted go though, knowing that I have a pile of earring parts sitting here ready for finishing. It's a small, hopefully manageable goal for each day. I'd join you on an earring a day challenge.....I have none myself and none to sell and wish I made more! We could do one day earring, one day bird for a month????? I'll join you Vickie, I've got too much going on in my life as well so the relaxed rules is perfect for me and earrings are one of my favs. Thanks for starting this! !